This lovely, round, eggy fellow showed up in our house over the weekend. It may have something to do with Miss M's school lesson tomorrow that includes boiling an egg and memorizing a well-known nursery rhyme! Be sure to check out the free pattern offered by ikat bag! Thank you for inviting me here. 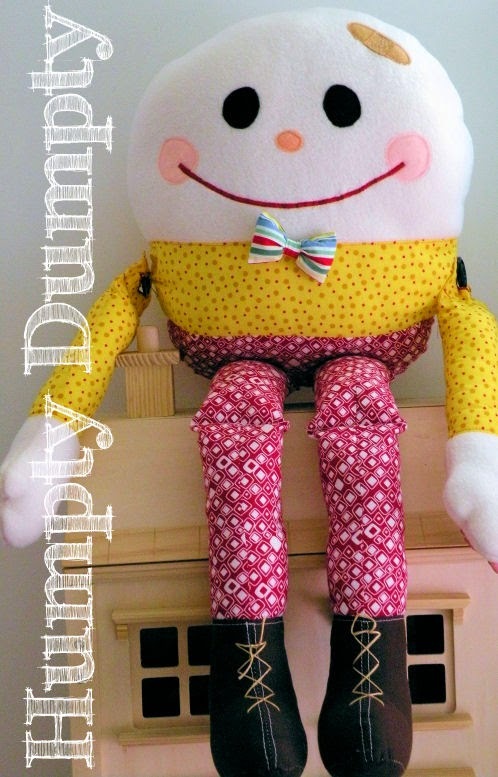 What a nattily dressed Humpty yours is! His bowtie alone is far, far superior to my poor Humpty's. I am so glad I got to come see! Ha, his bowtie was sewn on last night, lit by a crack of light from the mostly-closed-closet, after the kids were in bed. Only this morning did I discover I sewed it on crookedly! Oh well, he's very popular with Miss M and even Little Guy babbles and coos at him (and chews on a detached arm till it's a soppy, soggy mess)! He is bigger than yours...not entirely sure how that came about though. I must have done some funky printing. I do confess to having used some birthday money to purchase a fat quarter at JoAnn's expressly for his pants. Nothing in my "stash" suited his egginess. Wow yours turned out cute too! I love your fun fabrics. Thanks for inviting me here to see him. Also you are an amazing dress maker. I am impressed. Thanks! I love the fabric too...thanks to a JoAnn's gift card I got for my birthday. I think the print on the pants looks somewhat eggy...like squared off eggs sunny side up. Ha! He's been getting lots of love around here. Although Miss M really enjoyed knocking a real egg off the wall outside and seeing it break. She kept begging to do it again.